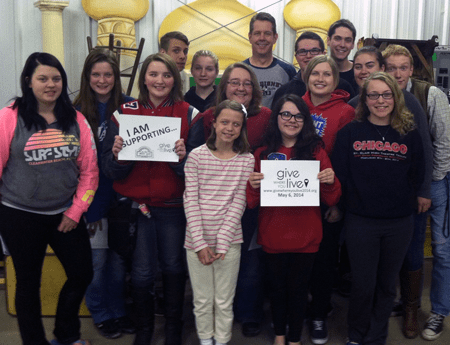 The St. Clair Theatre Guild is participating in “Give Where You Live 2014,” a nationwide day of support for non-profit organizations. The program is being coordinated locally by the Community Foundation of St. Clair County. Give Where You Live is a national event with local impact. We are joining hundreds of communities across the country in a one-day giving challenge to raise funds for local causes. Every donation will receive matching funds from local and national sources, increasing the impact of every gift. There will also be prizes and incentives awarded throughout the day. Imagine the impact we can have if we invite our whole community to give where you live! Give Where You Live 2014 will be Tuesday, May 6th! Check back on the Guild’s website on Tuesday or visit the Community Foundation’s special website for the event to participate in this powerful community event! 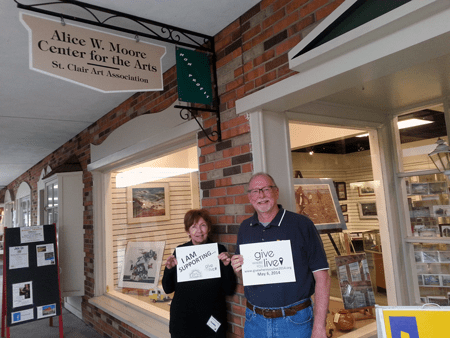 Staff of the Alice W. Moore Center for the Arts and the St. Clair Art Association! Thanks for your support! Staff at Sonja’s! Thanks, friends! This entry was posted in News and tagged Fiddler on the Roof, Give Where You Live, Sonja's, St. Clair Art Association on May 4, 2014 by Tom Kephart.